HOME This page was last edited 04/21/2019 . Please email me. 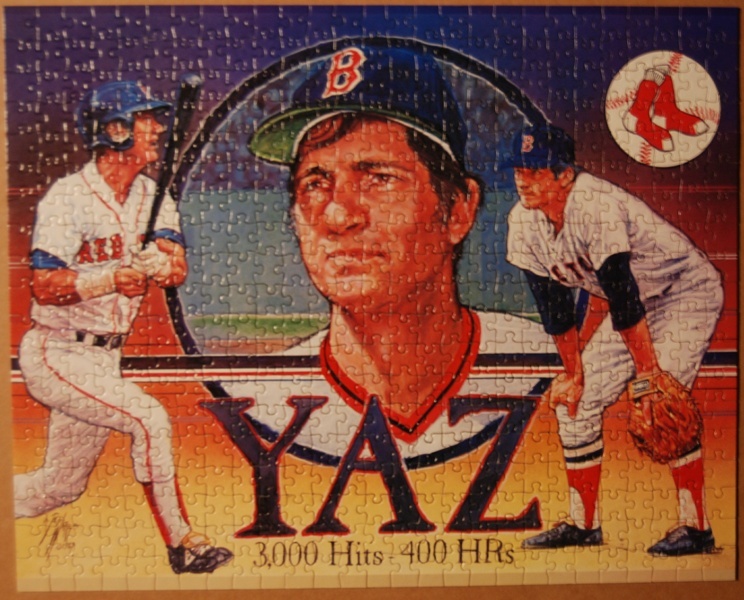 Here's a link to my Puzzle Instructions page. 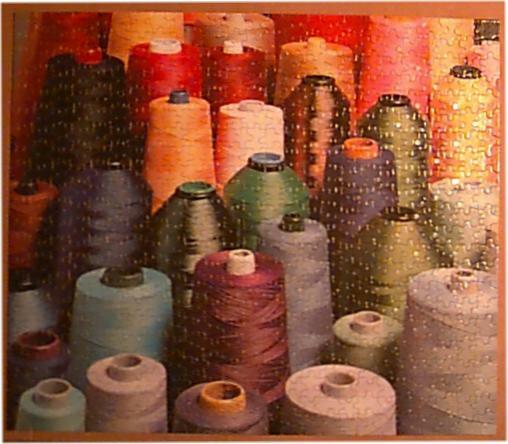 Some jigsaw puzzle links to order puzzles online . 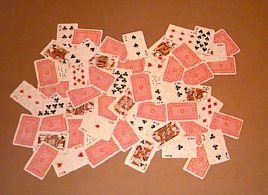 Below are puzzles I've put together. 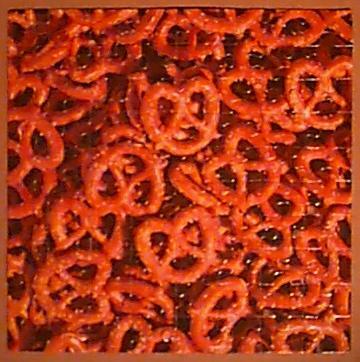 This is a 3D jigsaw puzzlw. It was given to me for Christmas 2018 from Nick's friend Taylor. It wasn't too difficult to complete. 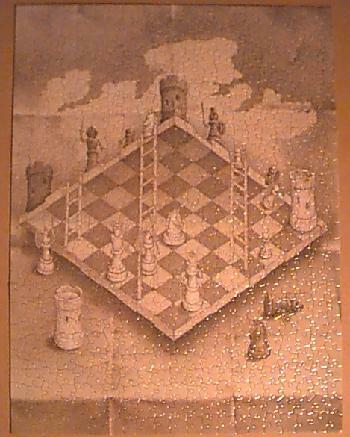 It is a Ravensburger 3D puzzle 12 577 7. It's 15.2" tall by about 4" in diameter. 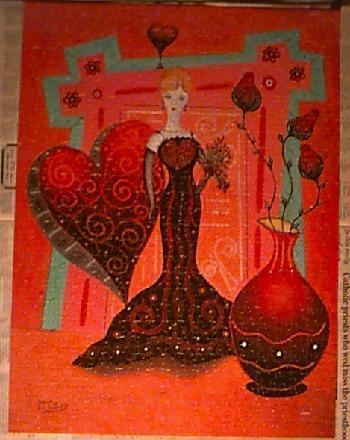 Krypt Gold 15 152 3 by Ravensburger. This puzzle is 100% gold. It is the mate to puzzle number 52 which is 100% silver. This is another Eurograhics puzzle. 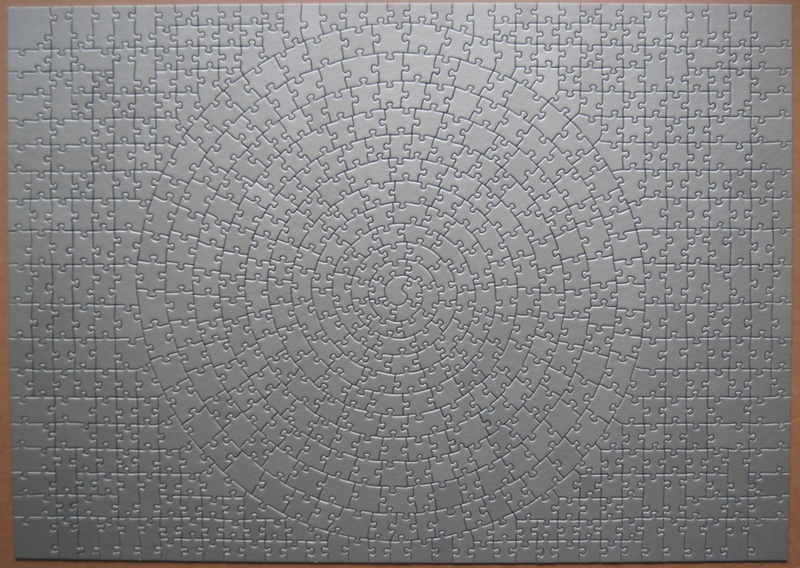 1000 pieces, 19.25" x 26.625"
1000 pieces, 675mm in diameter. That's about 26.5 inches. This is the glow in the dark view. It's very difficult to image something glowing in the dark. 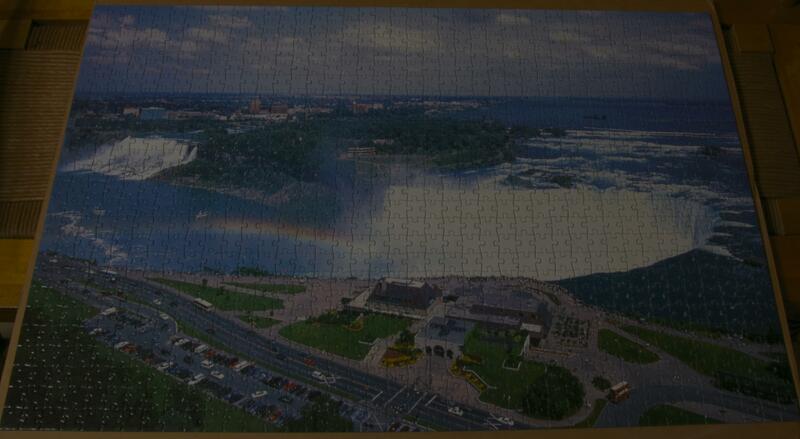 This puzzle was given to me for a 60th birthday present by Rhonda's sister Julie. 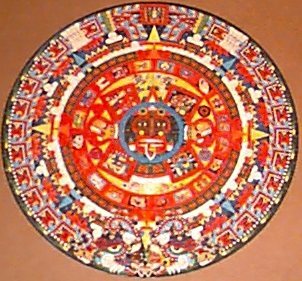 It is a depiction of the alignment of the 4 outer planets. 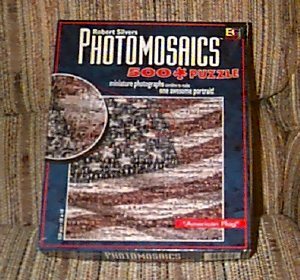 This puzzle glows in the dark. 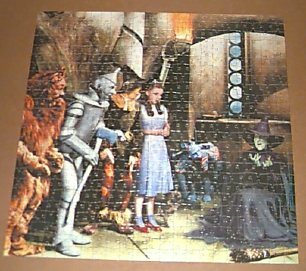 Ebay and a very demanding job kept me from completing any puzzle for about 7 years. This was very easy to complete. Kim helped by sorting the pieces by color. 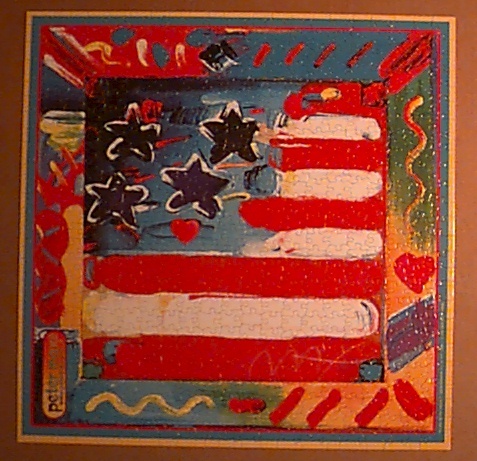 1000 pieces 19.25" x 26.625"
I decided not to finish this puzzle. 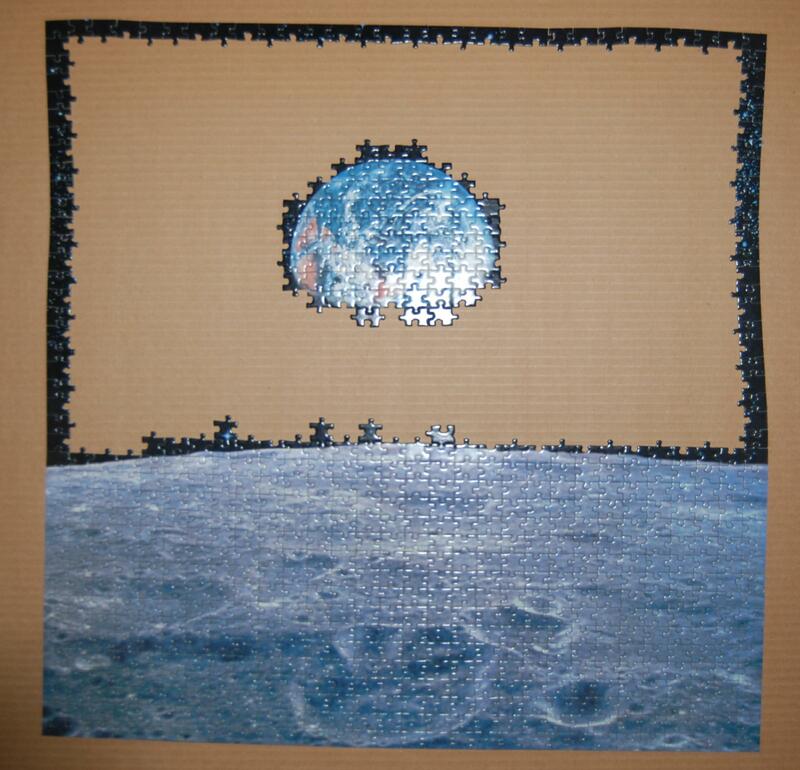 The remaining area was essentially all black and I have another puzzle I want to work on. 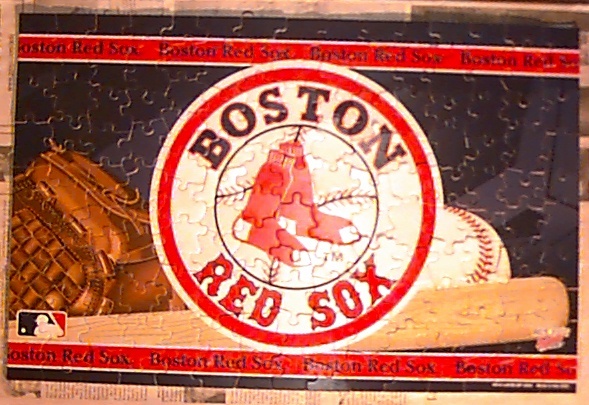 765 pieces, 38.25" x 11.25"
Boston Red Sox Great ! Kim and I did this in less than 24 hrs. 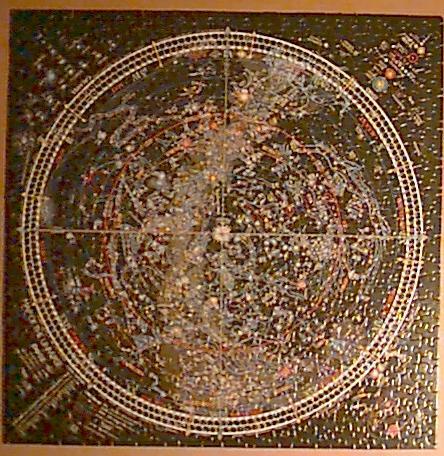 #7215 by Gameophiles Unlimited Inc.
500 pieces, 18" x 24"
This is the 2nd or 3rd puzzle of the stars and planets I've completed. Each one is unique. 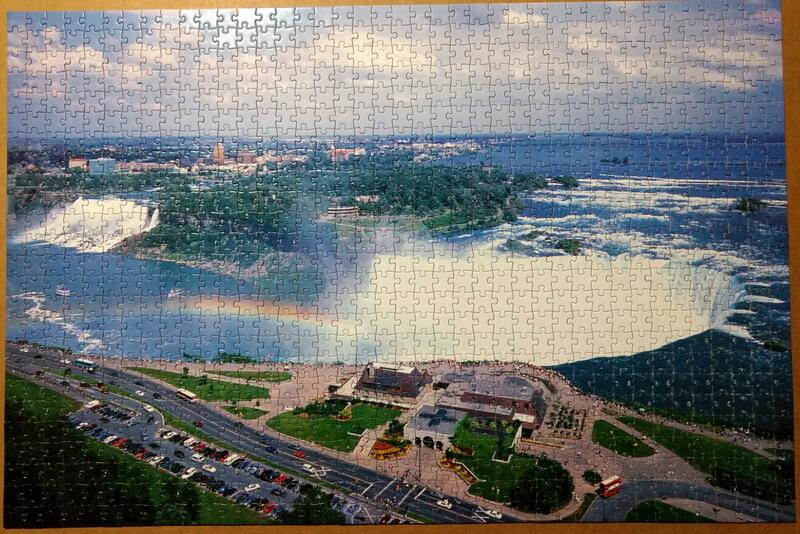 Rhonda & Kim helped complete this puzzle. 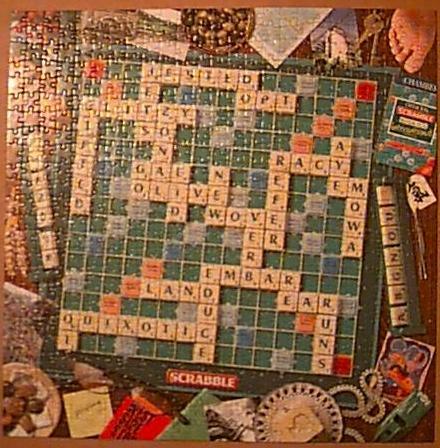 This puzzle came from England. It only took 2 days to complete. Kim helped a lot. 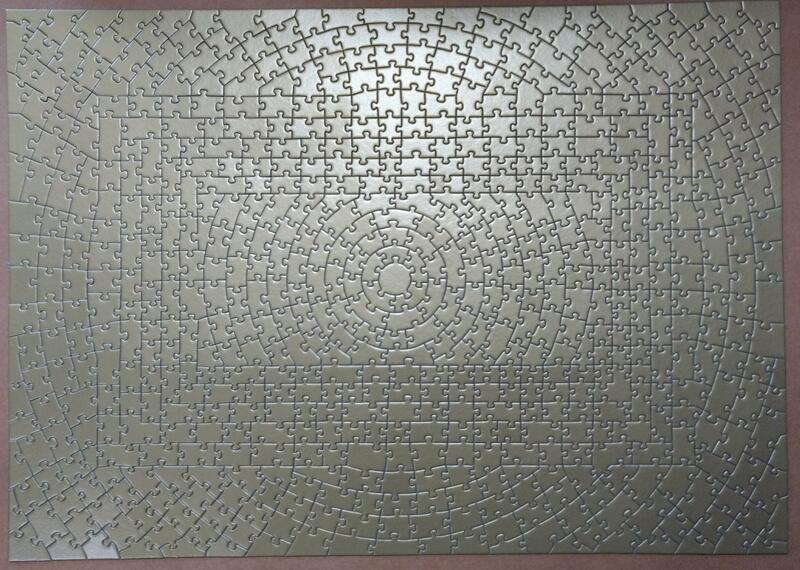 Krypt #15 964 2 by Ravensburger - this puzzle is 100% silver. It spirals from the center out and then is squared off at the sides. 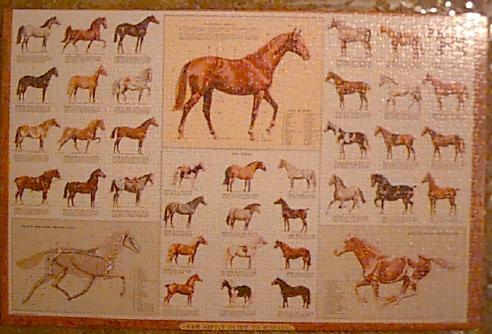 This puzzle is titled "Parade of Thoroughbreds"
This puzzle has no title. I call it "Colorful Bobbins". 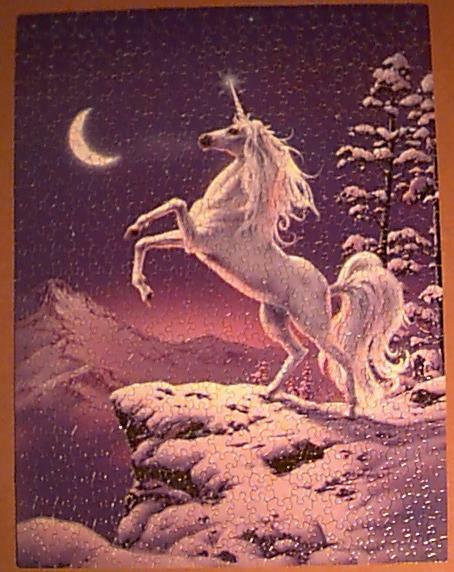 Rhonda and I completed this in less than 2 days. 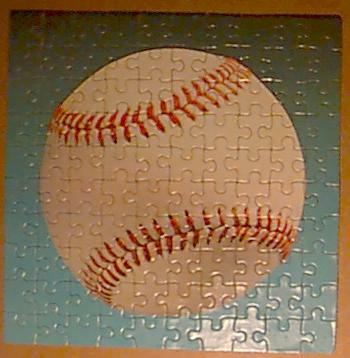 I did this puzzle to frame for my friend Jo-Ann as a Christmas gift. 8/13/05 - 8/20/05 Scuola di Atene "Stanza della Segnatura"
This puzzle was given to me by my sister Lori. She got it in Italy. Click on the link to visit a website with more information about the painting. 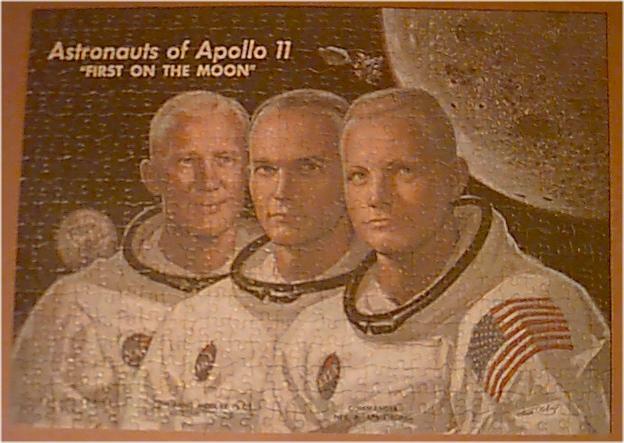 This is a puzzle is titled Astronauts of Apollo 11. "First Men On The Moon"
This only took a few days to complete. 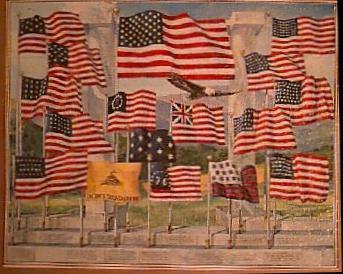 This puzzle is a Colonial Flag by Warren Kimble. Kimberly completed the edges for me. We had to do the edges twice. 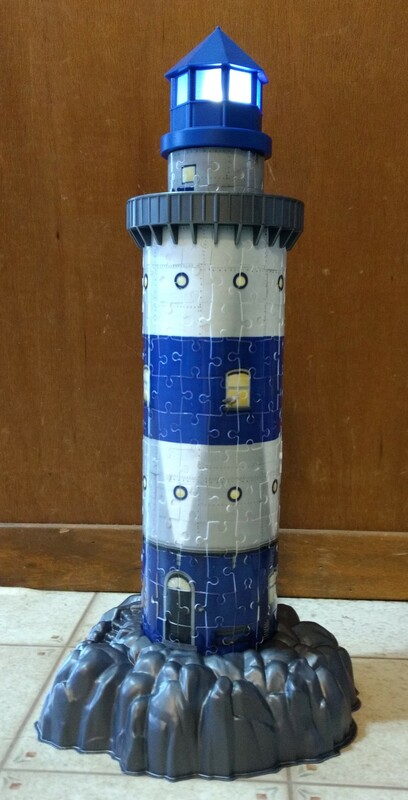 It dropped moving it from the living room to the puzzle room. 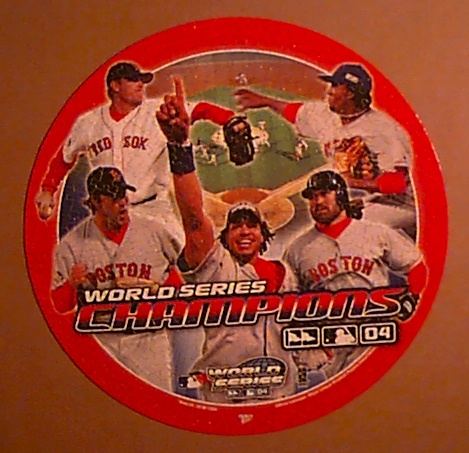 This puzzle is commemorating the Boston Red Sox 2004 World Series victory. and completed it after we returned. 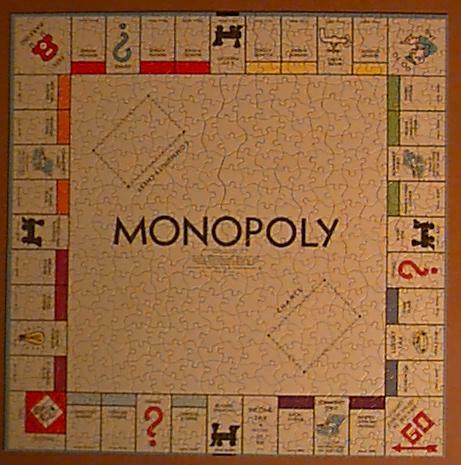 Monopoly Board. 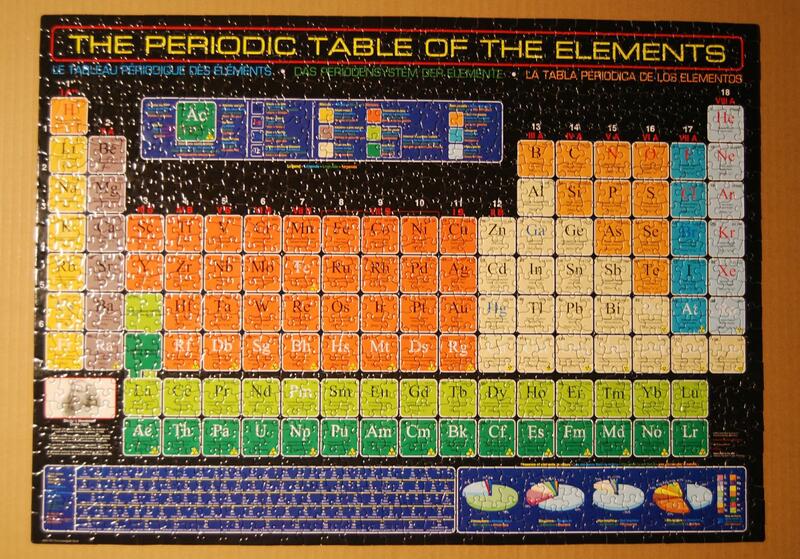 This puzzle consisted of 625 pieces and was very easy to complete. 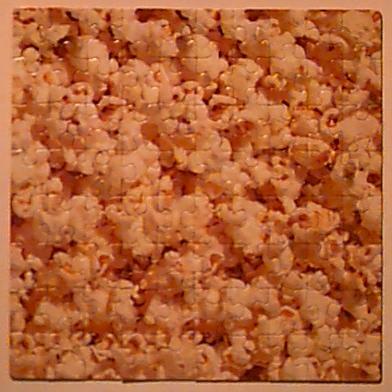 It was quite obvious where most of the pieces went. 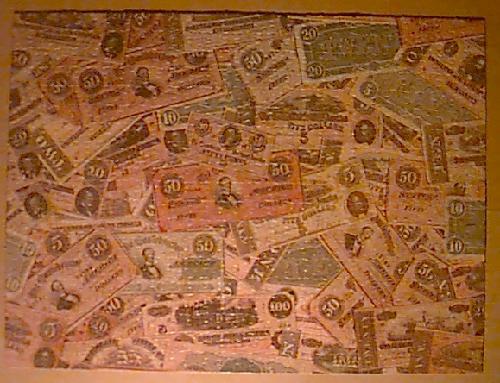 This is the 3rd Monopoly Board puzzle I bought and completed. The first 2 each had a different piece missing. 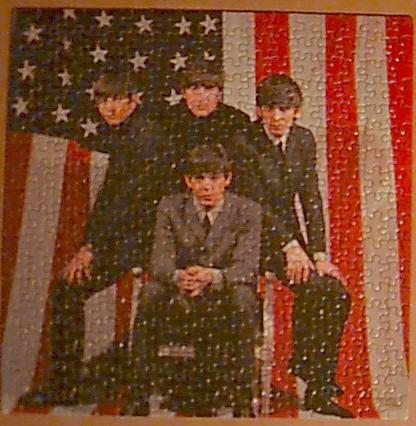 I bought them on E-bay and there was no guarantee all the pieces were there. Visible is the Mediterranean Sea south to the Antarctica south polar cap. 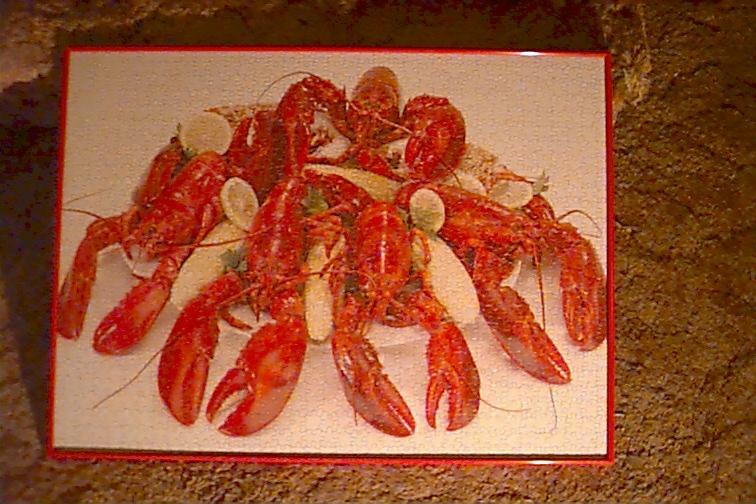 This puzzle is titled Lobster Feast. It took a very long time to complete, mostly because I didn't work on it for almost a year. like to display it at each party. 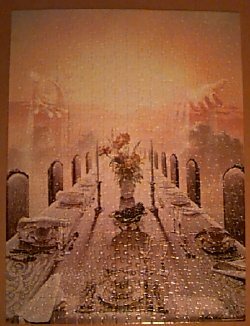 It was 1,000 pieces and was very challenging to complete. It took about 20 hours over 7 months. 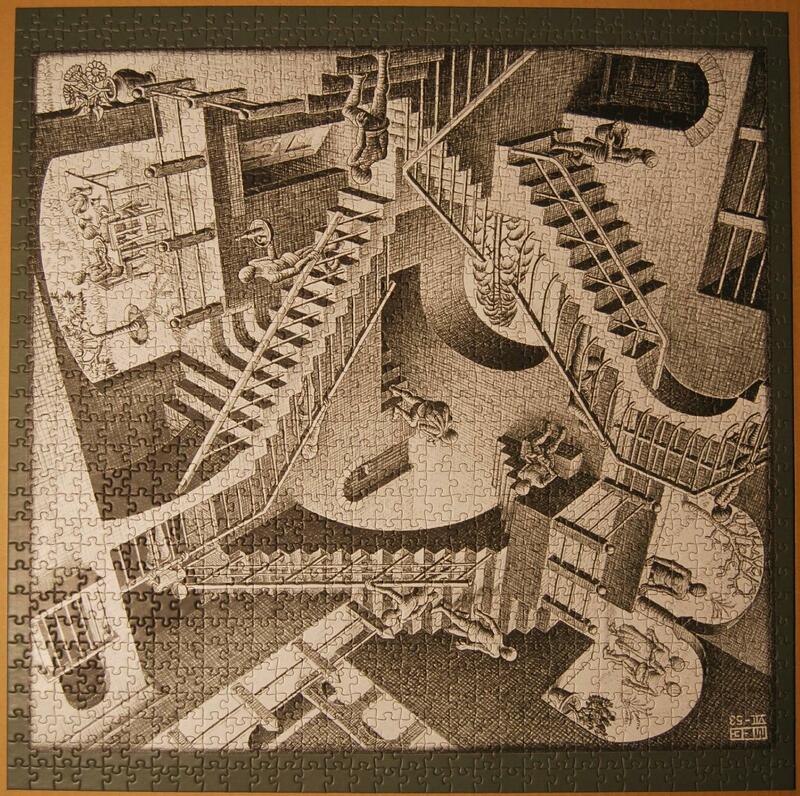 I have another puzzle by M. C. Escher to complete. 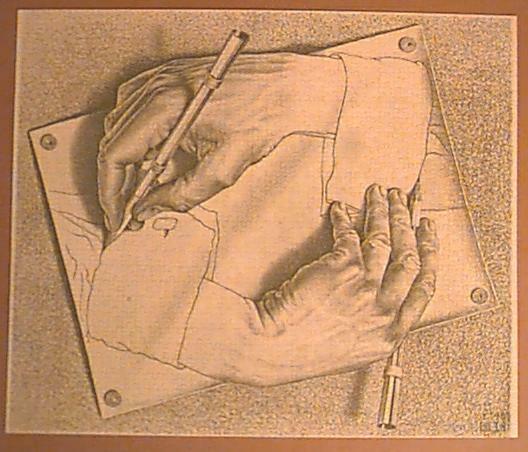 Many of his drawings have been made into puzzles. 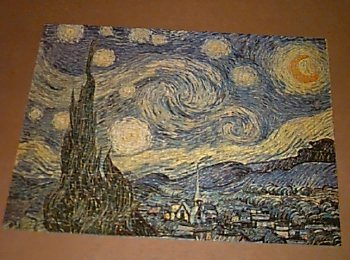 I have been wanting a puzzle of this art work for many years. 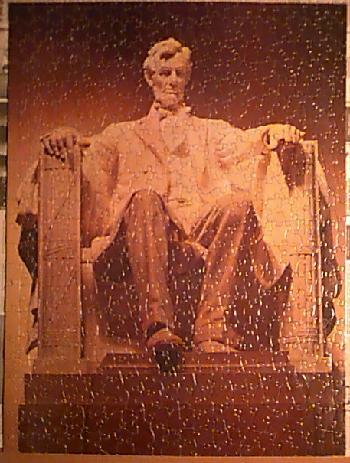 It took 5 hrs 10 min to complete and was 550 pieces. 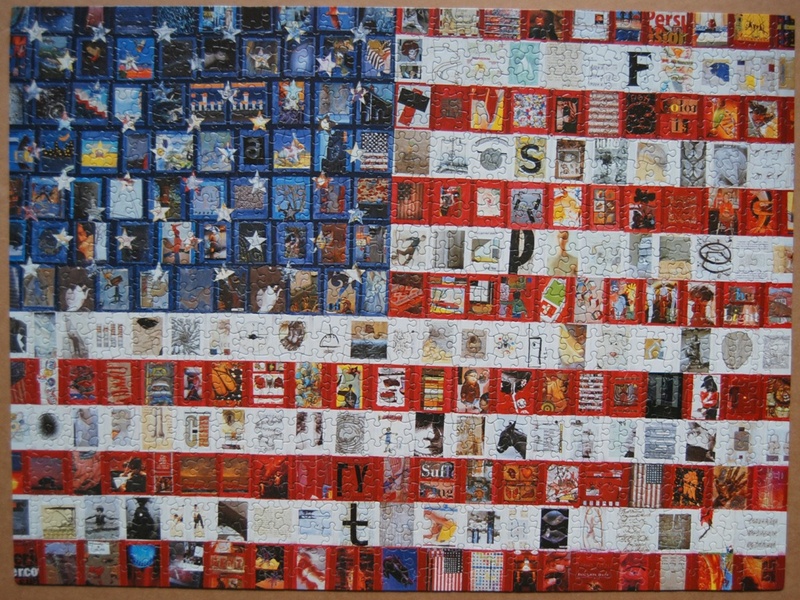 This puzzle is titled American Flags. 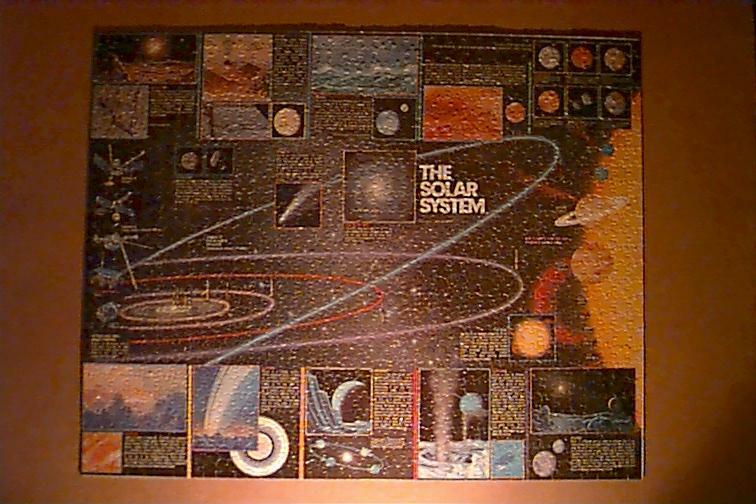 It was 1,000 pieces and is 24" x 30". These are each 80 pieces Kimberly and I did them together. These most likely will not get framed, nor eaten. 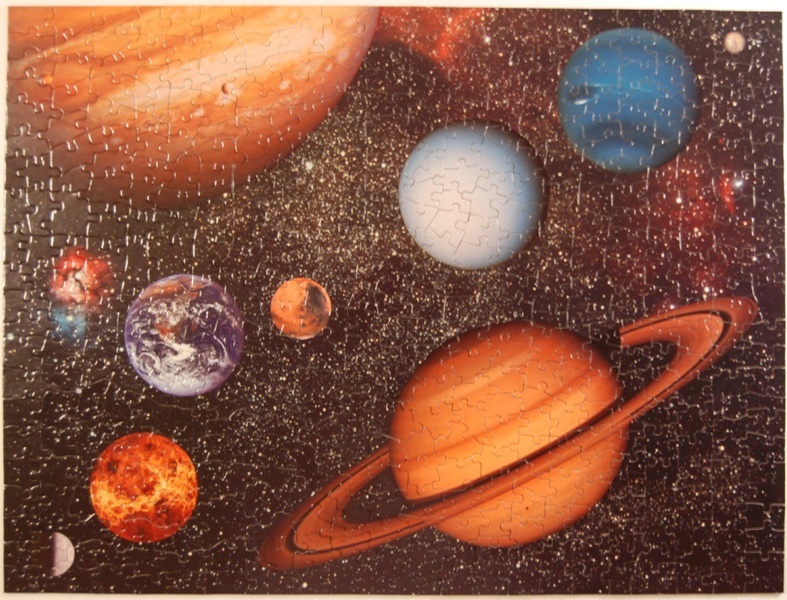 This is a puzzle of The Solar System. Rhonda helped me start this and do almost half of it. Kim helped me complete it. It only took 3 days. 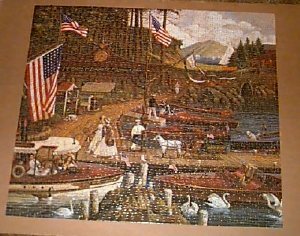 It is 1,000 pieces and was fun and easy to complete. 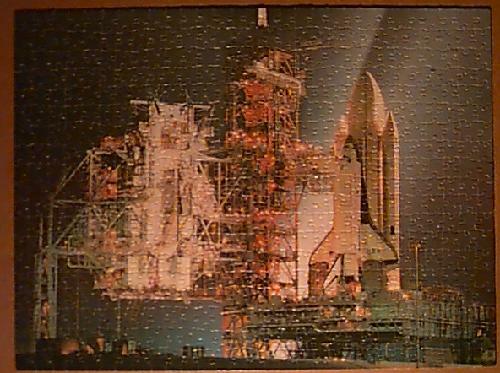 I placed a bid for this puzzle on Ebay the day after Columbia exploded. It was listed before the accident. I've looked a long time for this one. Rhonda and I did this one is less than a few hours. There's no mistaking who this is. I framed this and gave it to Melissa for her kindergarten class. I think the teacher displays it each February. Map of The Universe with Zodiac. 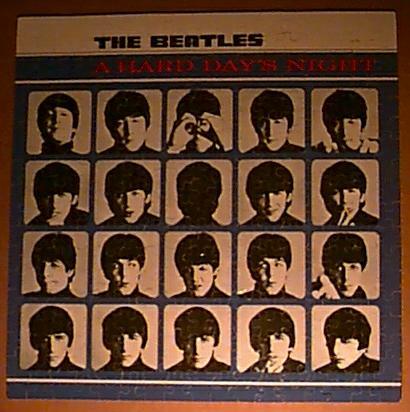 This is a 2-sided puzzle of The Beatles' A Hard Days Night album. Melissa helped do this one. 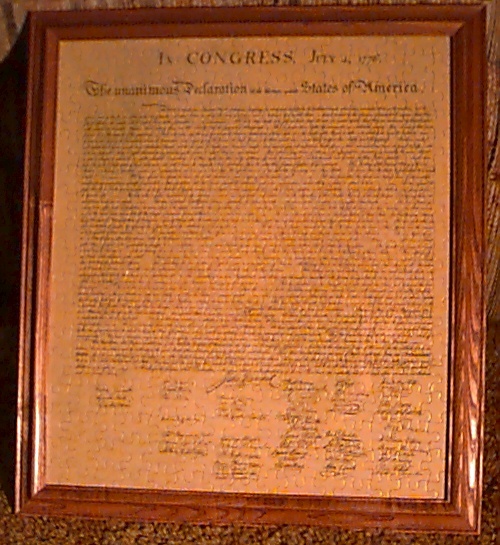 We framed it and gave it to Rhonda's father for Christmas. Kim and I did this for Nick. Kim did this one and I helped. It's framed and hanging in Kim's bedroom. 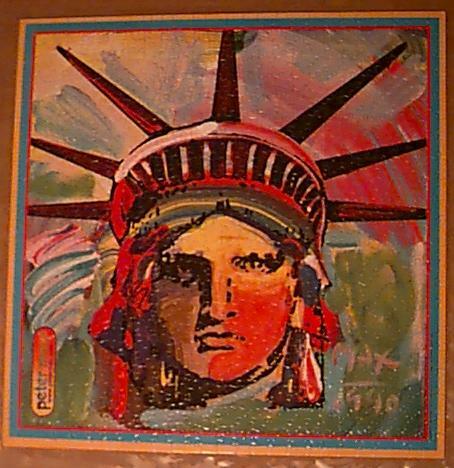 Puzzle of Peter Max's Liberty Head. 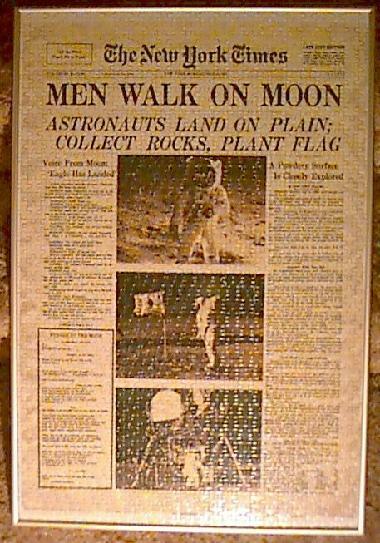 This is a puzzle of the New York Times cover of the 1969 Moon Landing. This puzzle was a little difficult to complete. 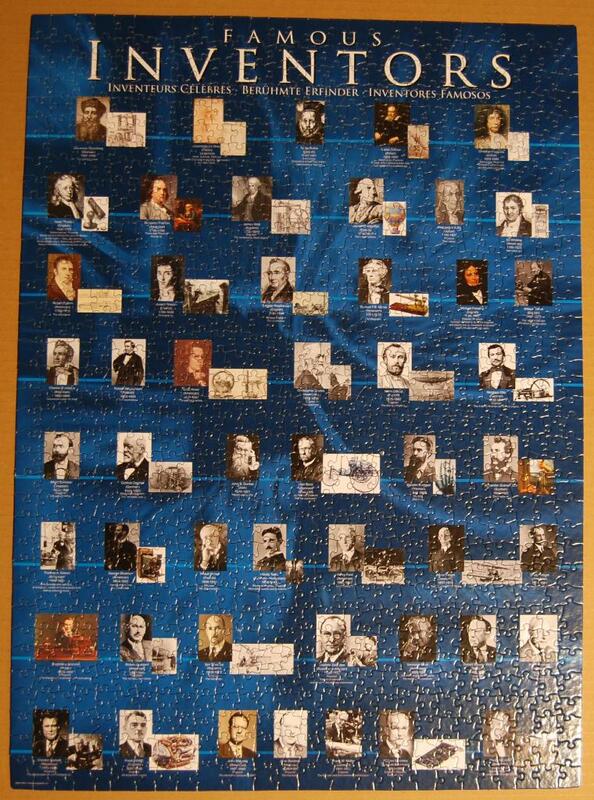 All the pieces were very similar in shape and the border pieces were interchangeable. I really think some are in the incorrect places but it doesn't matter. 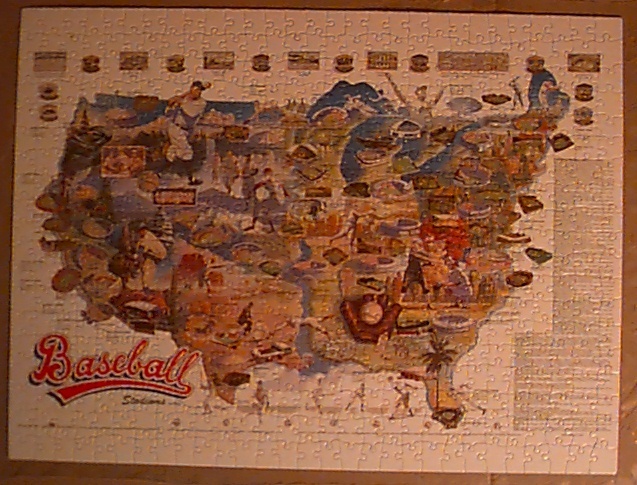 This puzzle is titled "Baseball Stadiums" It is the USA map with baseball stadiums positioned on it. There is also a history of each stadium. 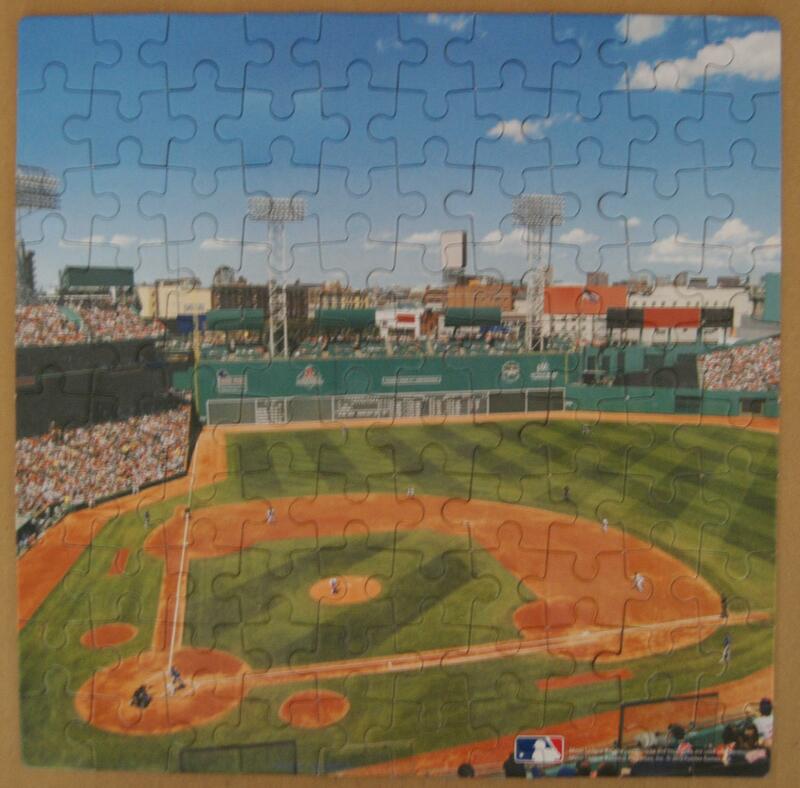 This puzzle was fun to do. 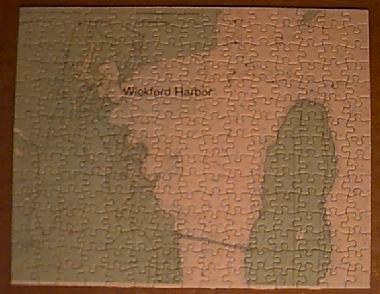 This puzzle is of Wickford, RI harbor. 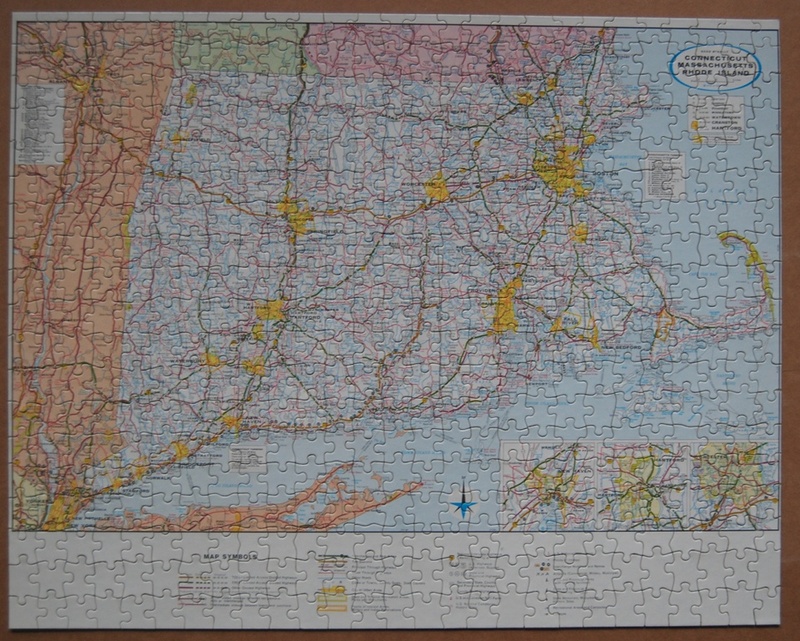 I got this puzzle from Canvasworks in Wickford. 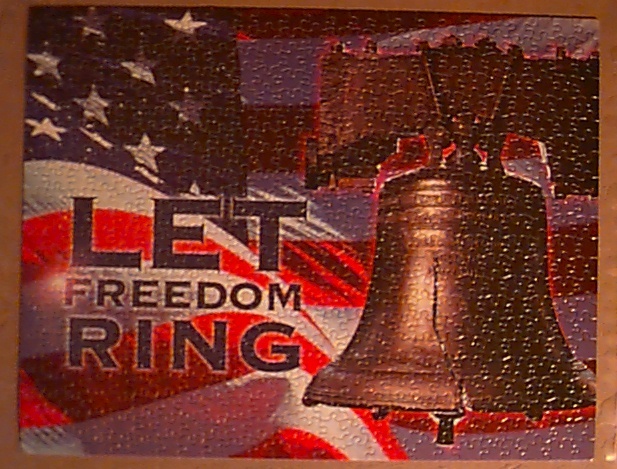 This puzzle, titled "Let Freedom Ring" was given to me by my friend Rhonda's daughter Melissa for my birthday. It took about 3 days to complete. Kimberly helped a lot on this one. She's getting good at doing them. 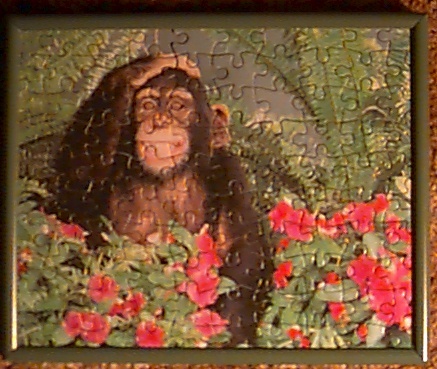 This puzzle was given to me by my friend Rhonda. It took over 5 months to complete. 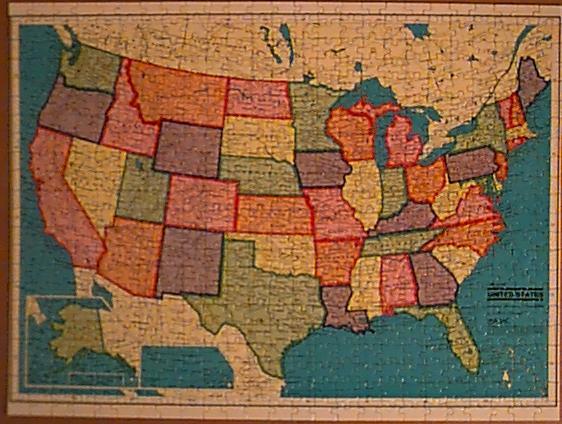 This puzzle took about 2 hours to complete. 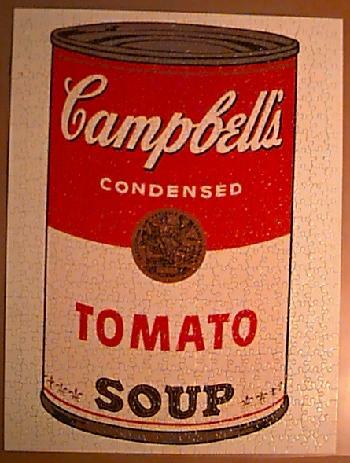 Andy Warhol's - "Campbell's Soup"
This puzzle took less than 2 days to complete. It was very enjoyable and easy. 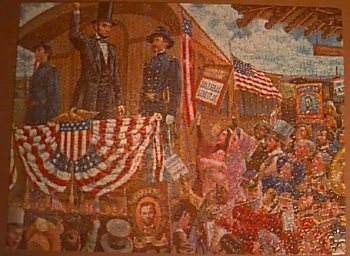 Titled "Lincoln Goes To Washington"
This puzzle took a very long time to complete. Not because it was difficult, but because I didn't work on it often. 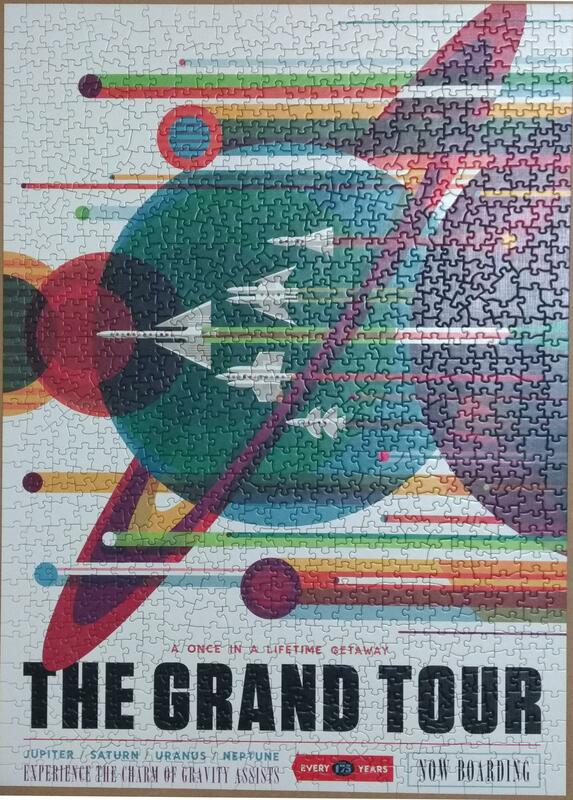 This puzzle was enjoyable to do. 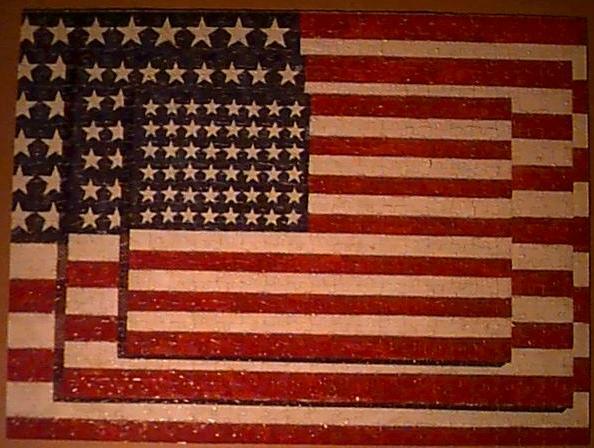 I started a this mosaic puzzle of the US Flag but twice it fell off the top of my car. That's right. Twice. You see, I do puzzles on a large sheet of cardboard on an octagon bumper pool table and wanted to use the pool table so I moved the puzzle to the top of the car in the garage. Well, of course I drove out of the garage with the puzzle on top and it went all over the street. My kids picked up the pieces and we put the puzzle back on the car because we were still using the pool table. And, you guessed it, I did it again. 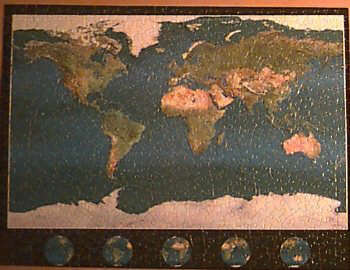 It was a very difficult puzzle anyway. Needless to say I never finished it. I'm certain we didn't find all the pieces. This puzzle was a Christmas gift from my friend Chris. At first it was very difficult, but got easy as I worked on it. I worked on this puzzle often. It was enjoyable to put together. 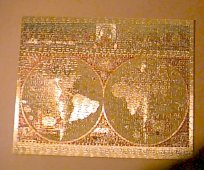 This is a gold metallic puzzle of the "Old World"
A puzzle of playing cards. 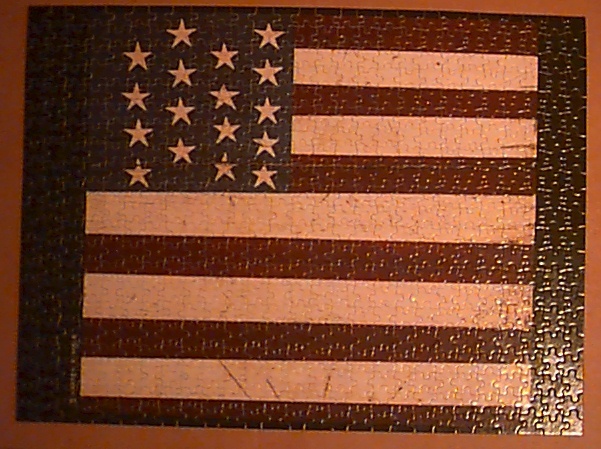 The edges of this puzzle was just as you see it. This is titled.. "Wooden You Like A Ride"
I think you recognize this one ! 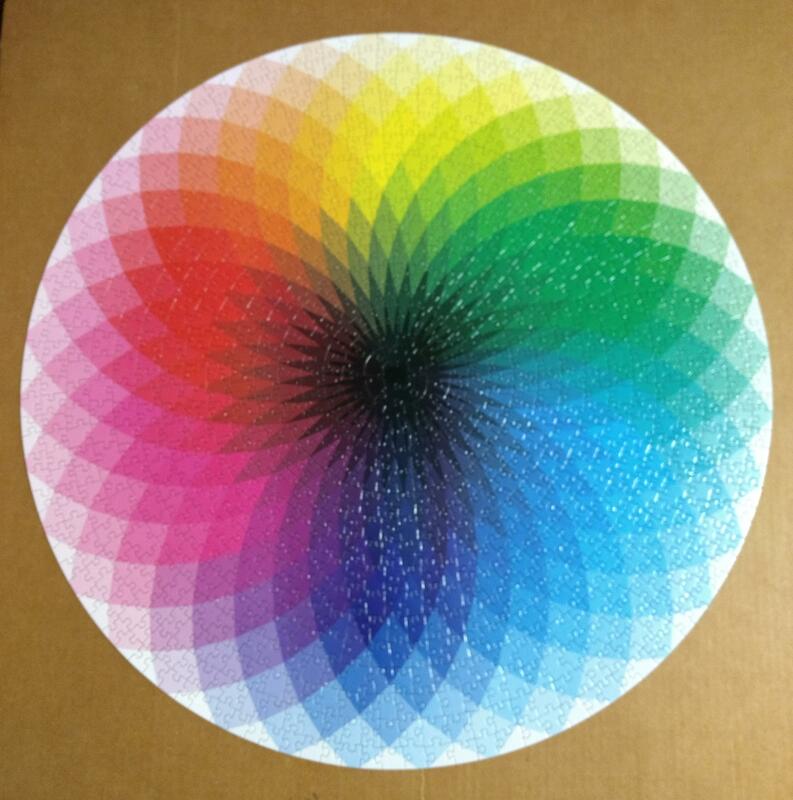 The web site colors are not as they are in the real puzzle. 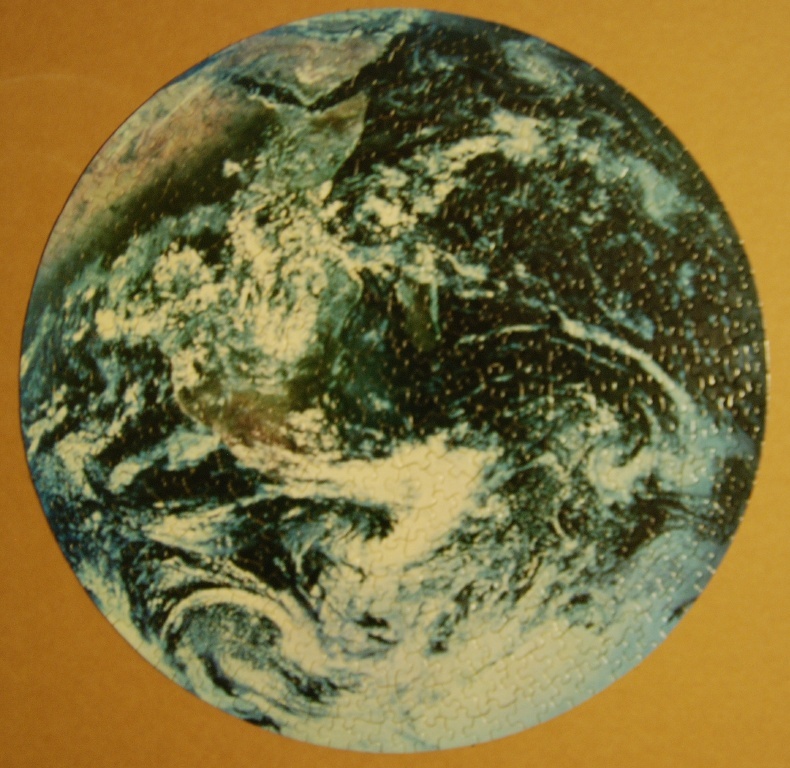 This is the view of The Earth From Space. 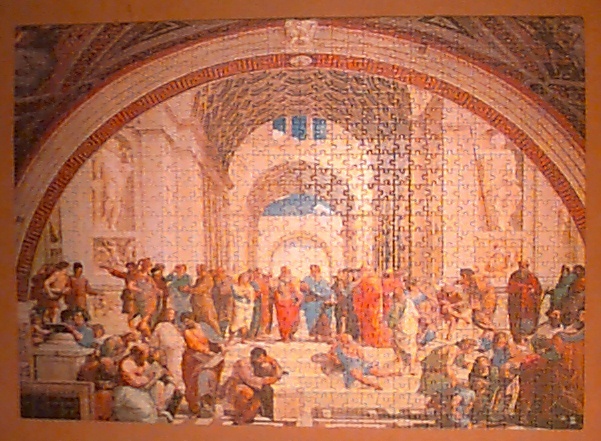 It took only 3 days to complete. Not because it was easy, but because it was interesting and fun to do. 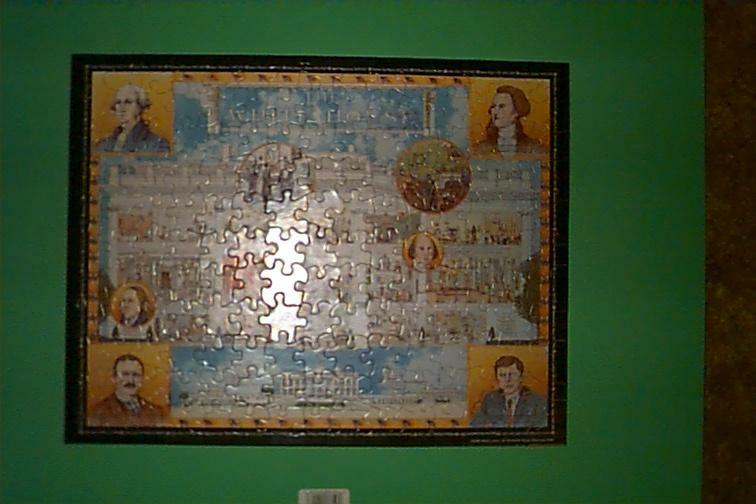 We bought this puzzle at the Heritage Map Museum in Letitz, PA. 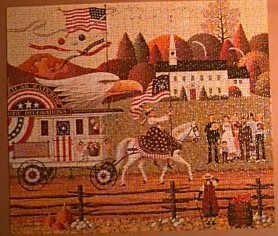 This puzzle was 1000 pieces and took about 2 months to complete...that's because we didn't work on it much for a long time. But it probably took about 1 week to complete.